TORONTO – Parliamentary Secretary Kelly Block, on behalf of the Honourable Greg Rickford, Canada’s Minister of Natural Resources and Minister for the Federal Economic Development Initiative for Northern Ontario, today announced an investment of $20.6 million in forest sector innovation to help create and protect jobs for Canadians. This new support is part of Canada’s comprehensive strategy for enhancing innovation and competitiveness in Canada’s forest industry… The funding announced today will support 2015–2016 research by FPInnovations — Canada’s national, industry-led forest research organization — to help develop leading-edge technologies, processes and products in Canada’s forest industry. The Coast Forest Products Association will be spending a good part of 2015 helping the BC government develop new markets for wood in India and re-strategize its relationship with China and Japan. However, CFPA president and CEO R.M. (Rick) Jeffery points out after agreeing to talk about the road ahead, equal if not more effort will be spent promoting forestry to home-grown media outlets and the public… “Far more important to us is dispelling myths about our profession that continue to prevail.” When asked if it’s still a matter of environmentalists influencing the mainstream media, which in turn influences public opinion, which ultimately affects government policy, Jeffery replies, “All you need to do is pick up a newspaper to see that we’re still portrayed in a negative light. A lumber company with operations in Cranbrook has been ranked on the 2015 TSX Venture 50 list. The list ranks companies that are strong performers on the TSX Venture Exchange Jemi Fibre Corp. ranked second in the Diversified Industries Category. “We are pleased to be ranked amongst the top performing companies on the TSX Venture 50 list,” said Mike Jenks, CEO. “This recognition by the Exchange supports and encourages our goal to build long term shareholder value in the forest products sector through integrated operations and a focus on unique timber and manufacturing assets.” Jemi Fibre is a British Columbia based forest products company which trades on the TSX Venture Exchange under the symbol JFI. [BC] happens to be endowed with a broad array of commodities and commercial sectors, as well as an equally diverse cluster of trade partners. Such advantages will help B.C. lead all other provinces in economic growth this year, according to a Conference Board of Canada report released earlier this week. …BC Stats lumps energy products in with “natural resources” — which also includes the forestry and mining sectors. They all account for just 7.8 per cent of GDP. It’s a blessing in disguise because resources are prone to boom-and-bust cycles. …B.C.’s largest export is wood products and pulp and paper, together accounting for just 32 per cent of all goods shipped. The B.C. sawmill industry is making progress in controlling potentially explosive wood dust, but monitoring will continue, says WorkSafeBC. The chief agency responsible for workplace safety issued only three orders for wood dust problems during the latest inspection period between Oct. 1, 2014 and Jan. 31 that involved 117 sawmills. The results, however, cannot be compared to those from the four previous inspection rounds when dozen of orders were issued because this time WorkSafeBC gave companies that had a good wood dust safety record the option of conducting their own daily inspection and reporting to WorkSafeBC on a weekly basis. Of 106 mills who passed previous rounds of inspections, 96 chose to do this. Profits from a municipally owned forestry operation are set to finance upgrades to the Valley’s airport, but funding for this project and several others has been delayed until city council gets more information on what they’re supporting. The Alberni Valley Community Forest encompasses 6,400 hectares of land by Sproat Lake, a logging project that has yielded $350,000 in profits currently sitting in a reserve fund. A legacy committee released a list of projects to invest this money into, with $185,750 in upgrades to the Alberni Valley Regional Airport at the top of the recommendations. CALGARY – The Irving family, one of Canada’s richest and New Brunswick’s most powerful, appears to be at odds over the routing of TransCanada Corp.’s proposed Energy East pipeline. J.D. Irving, Ltd. (JDI), the family-owned forest products, logistics and shipbuilding company headed by James K. Irving and sons James D. and Robert, has filed an application with the National Energy Board saying it is “vitally concerned” about the portion of the pipeline that would pass through its Crown-leased lands in New Brunswick. JDI’s application said the company is concerned about Energy East’s “commercial impacts and environmental effects” on the company’s forestry and other businesses as well as the “appropriateness of the general route and land requirements for the project in New Brunswick” relative to JDI’s operations. US exports of hardwood lumber in 2014 as a whole were 13% higher than a year earlier at 3.901m m³. At +26% to $2.337bn, the value of the exports rose even more sharply than the volume. According to information from the U.S. Department of Agriculture (FAS), almost all the wood species and sales regions contributed to this growth in volume and value. In terms of the different wood species, the most conspicuous increase in volume was registered in walnut at +31% to 176,609 m³ and the export value rose by 46%. One thousand more jobs. That’s what Sen. Steve Daines hopes to bring to Montana through timber and legal reforms in the coming year. Daines presented his goal at a roundtable discussion last week with 15 representatives of the timber industry, local government and conservation community. The meeting was held at the F.H. Stoltze Land and Lumber offices in Columbia Falls. The new jobs would come from increasing the state’s timber harvest by 100 million board feet, the freshman Republican senator said. “There’s a great opportunity to pass meaningful timber reform this year,” Daines said. Following 2013 when European sawmills almost tripled their softwood lumber shipments to China, it seems that in 2014 this trend was set to continue, though at a slower pace. On contrast, softwood log exports declined sharply. In 2014, Chinese economy has declined to its lowest rate of growth in 24 years, with the country’s GDP registering a growth of only 7.4%, recording the slowest rate since 1990 and below the official target of 7.5%. Moreover, China’s construction sector is also on a downward trend, with the Chinese government still searching for solutions to avoid a housing crisis. Marshall began by pointing to the critical elements of smarter building skins and systems. He said Canadians are experts in adapting to cold extremes, performance codes and innovative building skins solutions… The building skin lasts for 50 years and is the main source of protection in a building, so it is important to get it right, Marshall said. Marshall used a six-storey fire-protected wood midrise in the Lower Mainland as a test case for his “smarter skin” principles. Wood offers attractive faces, varied features due to wood frame flexibility and natural thermal advantages. He said that with wood midrises “there are floors we’ve never worked with before” so the building type requires innovative solutions. IN THE aftermath of last month’s devastating fire at an Edgewater apartment complex, there is increased and understandable attention on how to stop such blazes from occurring in other locales. One of those locations is Wayne. Across the state, municipal officials are zeroing in on lightweight-frame construction, which can leave voids and passages in attics and walls, allowing fire to spread quickly. That apparently was what happened at the 408-unit AvalonBay complex in Edgewater. …We’re not convinced that a statewide ban on one type of construction is the way to go. It’s important to keep in mind that the Edgewater fire was started by workers using a blowtorch and compounded by the failure to immediately call the fire department. According to the report, the global lyocell fiber market was valued at US$ 692.7 Mn in 2013 and is anticipated to reach US$ 1,179.5 Mn in 2020, expanding at a CAGR of 7.9% between 2014 and 2020. In terms of volume, the global demand for lyocell fiber stood at 356.3 kilo tons in 2013. Lyocell fiber basically consists of a type of rayon manufactured from wood pulp and bleached to get the desired result. The major product that lyocell fiber is derived from is cellulose. …according to Lenzing AG, a leading textile company, a manufacturer can actually use low carbon biofuels to manufacture lyocell fiber. Lenzing uses wood pulp to create lyocell fiber. Another player, Weyerhaeuser had collaborated with Lenzing in 2008 to create nonwoven fabrics that use lyocell fiber. Canada’s new rail safety legislation would make it possible for governments to recover costs from railways for any fire they cause, not just accidents that involve crude oil, said Transport Canada, a change that could force railways to pay millions in costs associated with forest fires. Canadian National Railway Co, which is in a legal dispute with the Ontario government over a fire that burned about 40,000 hectares (98,842 acres) in 2012, criticised the legislation on Wednesday. But new cost-recovery measures announced last week, touted as a move to make the crude by rail business more accountable, would apply to any fire caused by a railway, Transport Canada said late Tuesday in response to questions from Reuters. Williams Lake, B.C. – The new allowable annual cut for the Williams Lake Timber Supply Area has been reduced by 2.77 million cubic meters. The cut had been 5.77 million cubic meters since 2007 to allow the forestry sector to get the most economic value from trees ravaged by the Mountain Pine Beetle . …Not only is the impact of the Mountain Pine Beetle reflected in the new cut limit, the recent Supreme Court ruling on the Tsilhqot’in title area is also taken into account. That ruling removed 141,769 hectares of land from the timber harvesting land base so it can no longer be considered provincial Crown land. While City of Powell River Council has called for expressions of interest in demolishing the old barge terminal buildings on the Westview waterfront, there may be interest in maintaining them. …council unanimously passed a motion that a request for proposals for the future of the barge facility be amended to include calls for potential development of the former barge facility. At council’s committee of the whole meeting earlier in the day, Mayor Dave Formosa said a recent Powell River Peak story and photograph generated interest and phone calls about potential uses for the building. Formosa said that an individual that he and Councillor Russell Brewer met at the recent Truck Loggers Association convention is trying to pitch for a value-added mill for the community. How can stakeholders work together to deliver value based on the elements of forest certification they all agree on? Bringing together stakeholders across a varied and complex supply chain can be an extremely rewarding, albeit challenging, prospect. GreenBlue’s Sustainable Packaging Coalition is leading a project that brings together the forest products supply chain to find strategies to better understand the value of forest certification and the best strategies for delivering this value. This group includes family forest owners, paper manufacturers, environmental non-governmental organizations (eNGOs), multinational corporations, loggers, paper merchants and many others. With such a varied group, and each bringing excellent ideas to the table, we have been most successful by starting with the right questions. CANYON CITY – Forest Service officials provided maps and aired plans for the Big Mosquito Project at last week’s Grant County Court meeting. The Feb. 18 presentation was the latest of several set to detail the next projects in the Malheur National Forest’s slate of restoration efforts that include logging, thinning, riparian enhancements and habitat improvements. Blue Mountain Ranger District Ranger Dave Halemeier called Big Mosquito the first broad-based watershed-scale restoration effort undertaken on the Malheur National Forest. The project area spans 36,000 acres around Galena on the Middle Fork of the John Day River. The proposed vegetation work is dominated by commercial and precommercial thinning to restore stand resilience. For about a decade now, steady collaboration on the ground in Montana has produced a number of proposals to increase active management, ensure recreational access and protect some of our last best places. But those proposals went to Washington, D.C., only to join the logjam of public lands legislation that had been building there for years. The logjam finally broke in December. U.S. Sen. Jon Tester worked alongside U.S. Sen. Steve Daines to pass the Rocky Mountain Front Heritage Act and the North Fork Watershed Protection Act, as well as several other important lands bills. As residents of the Blackfoot and Clearwater river valleys, we applaud their efforts. Join Gretchen Finch, a Whitefish resident, for her show celebrating “Workers in our Woods” at the Bigfork Museum of Art & History, March 6 – 28. The opening reception is on March 6 from 5-7 p.m. Gretchen grew up in New Jersey, but after visiting Wyoming as a teenager, she fell in love with all things Western. She graduated with a Bachelors of Fine Arts from the University of Arizona, was active in collegiate rodeo while attending, and later immersed herself deeply in the western lifestyle when she and her husband ran dude ranches in Jackson Hole. I was shocked to read that private timberland sales in the Klamath area have severely jeopardized agreements on water, a critical issue for this region. These agreements have been worked on for years and would help solve the conflict between Indians’ fishing rights and farmers’ water needs. As reported, they would have also helped to “rebuild their lost reservation.” This story paints a picture of many shameful actions. The land was sold to a Singapore-based company. AUGUSTA, Maine — Conservationists are skeptical about Gov. Paul LePage’s budget for the natural resource departments, fearful that it would open the gates for expanded commercial harvesting of state-owned property. LePage wants to do away with the state’s Bureau of Parks and Lands, which is responsible for the management of more than 600,000 public acres. Instead, management of that property would go to the Maine Forest Service. Last year, LePage pitched a plan to use the increased revenue from expanded harvesting of forests on state land to fund heating efficiency programs, but the Legislature balked. The largest land conservation purchase in state history was completed yesterday. The Natural Resources Board voted 7-to-nothing to pursue the second-and-final phase of a land acquisition in Douglas County that protects another 22,000 acres of mainly forest land. The first phase preserved about 41,000 acres, at a price of $11-million. The state will spend almost $2-million on the new phase, as its share of a $5.6-million purchase of easement land now owned by the Lyme Lumber Company. Federal funds will pick up the rest. The state’s acquisition began in 2012 at what will now be called the Brule-Saint Croix Legacy Forest. The lumber company has been allowed to continue managing the land for timber production, with new recreation opportunities at the Brule River State Forest. A south Wales larch forest clear-felled due to disease is being replanted with a wider species range for timber, wildlife and amenity value. 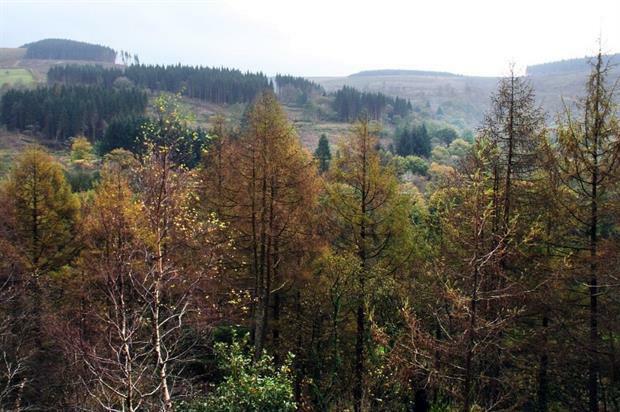 Around 650 hectares of larch affected by or at risk from Phytophthora ramorum have been felled in Afan Forest Park near Port Talbot. 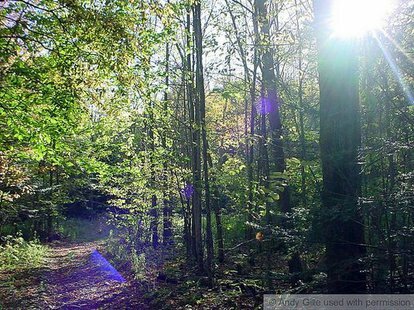 Natural Resources Wales has said the aim is to build a forest more resilient to climate change and potential new diseases, while also increasing biodiversity, improving water quality and reducing flooding. Its operational resources manager Andy Schofield said: “Like so many of the south Wales forests, this disease has had a significant impact, resulting in the felling of thousands of infected trees. Loss of tropical forests accelerated roughly 60 percent during the 2000s, argues a paper published in the journal Geophysical Research Letters. 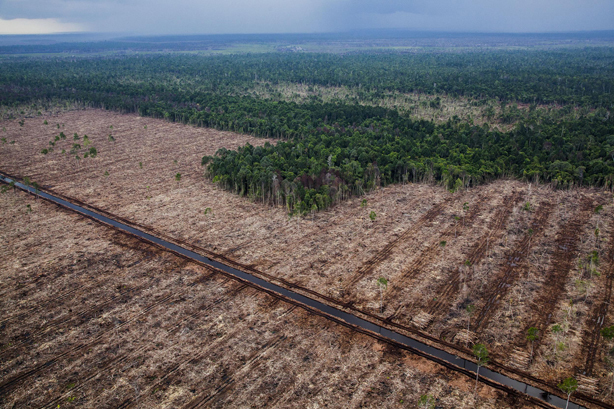 The findings contradict previous research suggesting that deforestation slowed since the 1990s. 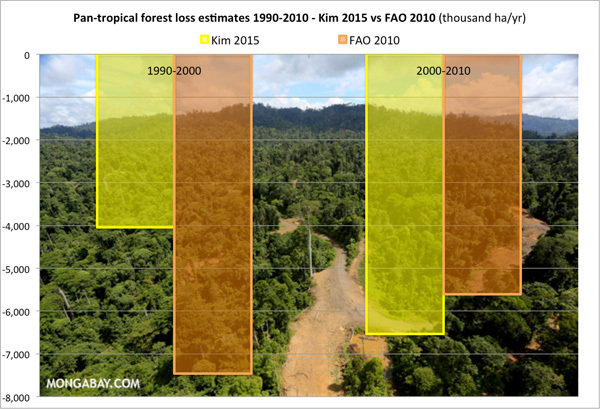 The study is based on a map of 1990 forest cover developed last year by Do-Hyung Kim and colleagues from the University of Maryland. The map, which includes 34 countries that contain 80 percent of the world’s tropical forests, enabled the researchers to establish a consistent baseline for tracking forest cover change across regions and countries over time. The forest industry has taken another step in implementing recommendations from last year’s forest safety review. It has established a safety council that will place all the industry’s safety improvement measures under the same tree. The council, representing forest owners, contractors, workers, unions and the government, will get going in early April. The industry set up the independent review panel after an appalling year of accidents in 2013, when 10 forestry workers died and about 170 were seriously injured. Forest Owners Association president Paul Nicholls said there was a dramatic turn-round in safety performance since then, and the council’s job would be to keep the momentum going. Extreme heat in northern Tasmania is transforming the look of the bush. 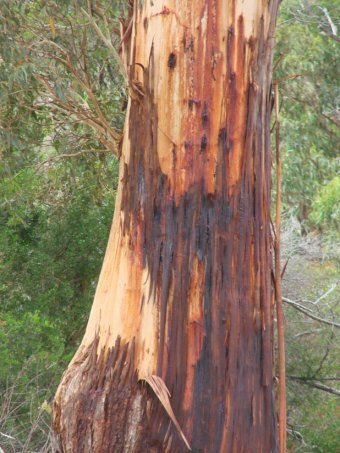 From Smithton to Bridport, thousands of eucalypts (mainly white gums and blue gums) have died or are stressed and leaking sap from their bark. “Once you see this thing it’s everywhere,” Brett Glanville an electrician in the area said. Mr Glanville travels all over northern Tasmania and he has been worried by what he has seen. Media player: “Space” to play, “M” to mute, “left” and “right” to seek “It’s through every forest, it’s through the plantations, it’s through old trees, it’s in parks,” he said. Here is a good news story from Africa. A story about how conservationists and forest managers are putting local communities at the heart of efforts to protect forests on critical upland watersheds. In Kenya, local famers are replacing state officials and forest wardens in the battle against a corrupt system intent on ransacking natural resources that once reached all the way to the president’s office. …Can local control work where the state failed? Will the country’s critical “water towers” be saved? For a country that depends on them for most of its water, food, and energy supplies, much is riding on the answer. New research suggests salty lakes common across the Prairie landscape are having different climate change effects than those with softer water. The paper, published in the journal Nature, says lakes in northern latitudes with hard, alkaline water are now helping remove carbon from the atmosphere instead of releasing it. What’s more, climate change itself is exaggerating the effect, said co-author Kerri Finlay of the University of Regina. “They started off like the soft-water lakes — they were releasing CO2,” she said. “But more recently, they started pulling it in.” Scientists have long held that lakes emit much more of the carbon dioxide that causes climate change than they absorb. At local stores that supply the wood pellets, the product has been quickly selling out. “It’s almost impossible, they’re shipping them overseas. It’s very short, we don’t have anything, we’re trying to secure some orders. It’s hit or miss at this point,” said Brenda Timmons assistant to Dave Gillis, owner of Gillis Home Building Centre in Sydney River. …Over the years, more people have been turning to wood pellets as a cheaper form of heating, but the amount sold locally hasn’t increased enough to meet that demand it seems. ..Another factor they state is that pellet consumption is outpacing industry production in Central Canada, New England and Atlantic Canada.